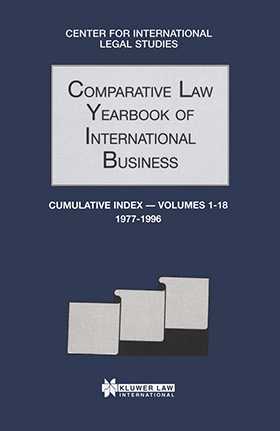 The Cumulative Index for the Comparative Law Yearbook of International Business lists all articles published from the inception of the Comparative Law Yearbook of International Business and provides information about the authors, the main topic headings that appear within each article, and the volume and page number where the articles can be found. The index also contains a table of contents and an authors' index. It facilitates research on all subject matter covered in this series. This is the second Cumulative Index. It covers all published articles from its inception in 1977 (then known as the Comparative Law Yearbook) to 1996. A new edition will be published in approximately three years.